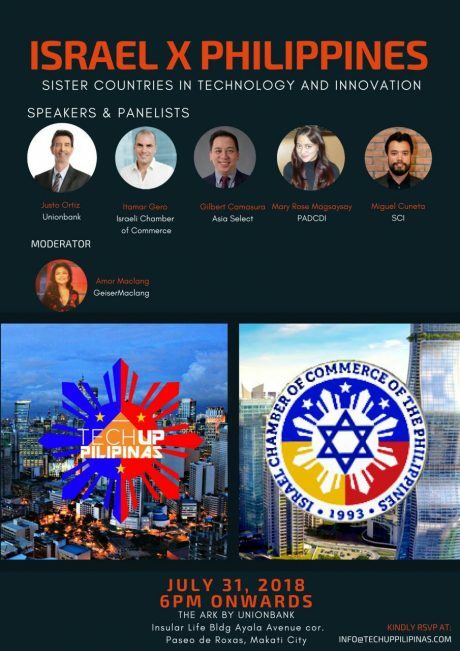 TechUp Pilipinas in collaboration with Israel Chamber of Commerce will hold Israel x Philippines: Sister Countries in Technology and Innovation on July 31, 2018 at The Ark by Unionbank. ICCP President, Itamar Gero is one of the panelists to share best practices about the financial technology landscape in Israel and how the Philippines can improve its own. Other speakers and panelists to share their knowledge are Unionbank's Chairman of the Board of Directors Dr. Justo Ortiz, Asia Select President Gilbert Camasura, PADCDI's Chairman Emeritus Mary Rose Magsaysay, and Satochi Citadel Industries Co-founder and Chief Community Officer Miguel Cuneta. Israel x Philippines: Sister Countries in Technology and Innovation is TechUp Tuesdays July topic. According to TechUp Pilipinas Associate Director and Unionbank Philippines Team Leader for Financial Technology Business Group Bryan Makasiar, TechUp Tuesdays is an avenue to share ideas to drive digital transformation and financial inclusion to reach common Filipinos. ICCP members, technology firms, and startups who are up for collaboration and willing to share how their tech-driven solutions work may email [email protected] to RSVP for this event. Read the full feature about TechUp Tuesdays here.